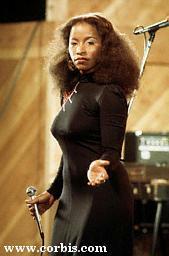 Chaka Khan:A True Diva For All Seasons! Blazing into the 80's, Chaka's "What Cha' Gonna Do For Me ? ", was released with great fanfare in 1981, and the title track became one of Chaka's biggest hits ever. Arif Mardin did things with Chaka's voice that were mindblowing, and 'What Cha' Gonna Do For Me ?' is a must for any Chakaholic's collection. The album was ventually nominated for a Grammy Award, and it also featured 'I Know You, I Live You', 'Night Moods' and the genre-splicing 'And The Melody Lingers On (Night In Tunisia)', which features be-bop legend Dizzy Gillespie (Charlie Parker's trumpet solo was spliced into the mix!). Chaka's love of jazz really flourished while working with Arif & Dizzy, and 'And The Melody Lingers On', which is one of the most vocally demanding songs that Chaka has ever recorded, is still featured on many jazz stations around the world! By 1981, Chaka was a soaring solo superstar, but she still had to honor her contract with Rufus, which required 2 more releases at this point, and to make matters tough, she wasn't on good terms with her bandmates. When all of the dust cleared, Chaka provided her vocals for the 1981 Rufus featuring Chaka Khan album titled 'Camouflage'. While Chaka was up to the challenge vocally, the album failed commercially, and the diva has always distanced herself away from it (like it never happened!). Chaka & Rufus were on such bad terms in 1980-81 that her image had to be digitally added to the group's album photo because of 'circumstances'. Chaka wasn't feeling 'Camouflage' because she had a booming solo career, and it would take another 2 years for the final Rufus & Chaka project's release. Following the highs & lows of 1981, Chaka eventually released the Mardin produced 'Chaka Khan' in 1982. Chaka's 4th solo album contained more great music, including a stunning remake of Michael Jackson's 'Got To Be There', and a duet with the late Rick James titled 'Slow Dancin'. Chaka also earned another well-earned Grammy for her 'Be Bop Medley', which prompted the legendary Betty Carter to praise her skills in jazz vocal improvisation. As popular as 'Chaka Khan' was upon it's release in 1982, it remains one of the most difficult CDs to locate in the United States, while Japanese Chakaholics have plenty of copies available in Tokyo. In addition to relaesing the 'Chaka Khan' album, Chaka provided vocals to the 'Echoes Of An Era' album, which included other jazz greats (collectively known as 'Griffith Park') Herbie Hancock, Lenny White, Joe Henderson, Chick Corea, Freddie Hubbard, and Stanley Clarke. This was the 2nd in a series of 3 'Griffith Park' albums, and the great Nancy Wilson fronted the band on a simply STUNNING live 'Echoes' album later in 1982. The Chaka fronted 'Echoes Of An Era' album was finally released on CD in 2003 by Rhino/WEA, and a rare interview (featuring comments by Chaka & Lenny White, the album's producer & drummer!) is a hidden bonus track. 1983 saw a reunion of sorts as Chaka rejoined Rufus to record 'Rufus and Chaka Khan Live: Stompin' at the Savoy', producing the watershed cut, 'Ain't Nobody', which was also a Grammy winner in 1984. Penned by the group's Hawk Wolinski and recorded as a studio track, the song still enjoys a special place in Chaka's repertoire. Chaka proudly admits, "Ain't Nobody is one of my favorite songs. It's a song I'll be singing probably for the rest of my life". 'Ain't Nobody' also appeared on the soundtrack for the movie 'Breakin' later in 1983, and this was Hip-Hop's introduction to The Diva. Also represented in Chaka's solo discography is the 'I Feel For You' (1984) album, which spawned an across-the-board smash (and another Grammy!) for the title track, which was composed & originally recorded by Prince on his 'Prince' (1979) album. With the amazing success of 'I Feel For You', Chaka continued to bond with lovers of rap music. 'I Feel For You' was one of Chaka's early connections to Hip-Hop Music, and it featured Stevie Wonder and rapper Melle Mel in key roles. In addition to the famous title track, 'I Feel For You' also includes strong material like the classic ballad 'Through the Fire' (which transcends the boundaries of radio play lists even today! ), and 'This Is My Night', which was written & produced by The System (of 'Don't Disturb This Groove' fame!). In addition to the successful 'I Feel For You', Chaka was also a featured performer on the 'Krush Groove' soundtrack in 1984 with the hip-hop classic 'You Can't Stop The Street', and this capped off a big year for The Diva! After a busy 1984-85, Chaka returned with 'Destiny' in 1986, and the results were suprising. 'Destiny' featured productions by Arif & Joe Mardin, contributions by Phil Collins (of 'Genesis'! ), and production by Dave Gamson (of 'Scritti Politti' fame), to create a collection of songs steeped in synthesized pop, elements of rock, with a hint of R&B. Most of Chaka's longtime fans were thrown for a loop, and 'Destiny' wasn't as big as it's predecessor, but songs like 'Tight Fit' & 'Love Of a Lifetime' ended up being successful singles. Chaka also recieved a Grammy nomination for 'Destiny' the following year, but with tracks like 'Earth To Mickey', the album didn't fare as well as expected. 'Destiny' is no longer in print for the American market, but it's available as a mid priced import (a $15-$20.00 Range).